For the second time in a little more than four years, high-stakes legislation is in danger of derailment. And, once again, Martha Coakley is at the center of the uncertainty. In 2010, it was her thoroughly dissected loss to Scott Brown, which jeopardized President Obama’s health care law. Now, it’s the Supreme Judicial Court decision on a casino referendum that will color the campaign season. While the casino question is sure to consume much of the political oxygen between now and the Nov. 4 vote, the ruling by the state’s highest court on Tuesday turned scrutiny on Coakley, who had effectively sought to block voters from having a direct say in a public policy question that has roiled Beacon Hill for years. But trying her best may not matter if her opponents seize on the decision to draw a damaging narrative against her. That could hit Coakley at one of her strongest points: her performance as attorney general. The argument among Coakley backers is that while she may not be the world’s most impressive candidate, once in office she does the job well. The court cleared the way for a repeal of the state casino law to appear on the November ballot. Decisions like Tuesday’s could undermine the argument and feed questions about her judgment, which has been previously called into doubt with a string of campaign finance woes ill-suited to the state’s top law enforcement official. Affable as ever, Coakley on Tuesday deemed the SJC ruling “thoughtful” and said it could be “instructive” for future attorneys general. An adviser close to Coakley defended her decision to try to stop the petition from reaching voters. “You make a call based on what you think is right and know that it’s going to ultimately be the court that decides,” the adviser said, speaking on condition of anonymity to discuss internal deliberations. The ruling could even work to Coakley’s advantage, relieving the animus that some anticasino voters felt toward her for depriving them of a chance to have their say at the ballot box. But the immediate effect was to put the attorney general back on her heels, defending that decision in the face of a resounding reversal by the SJC. 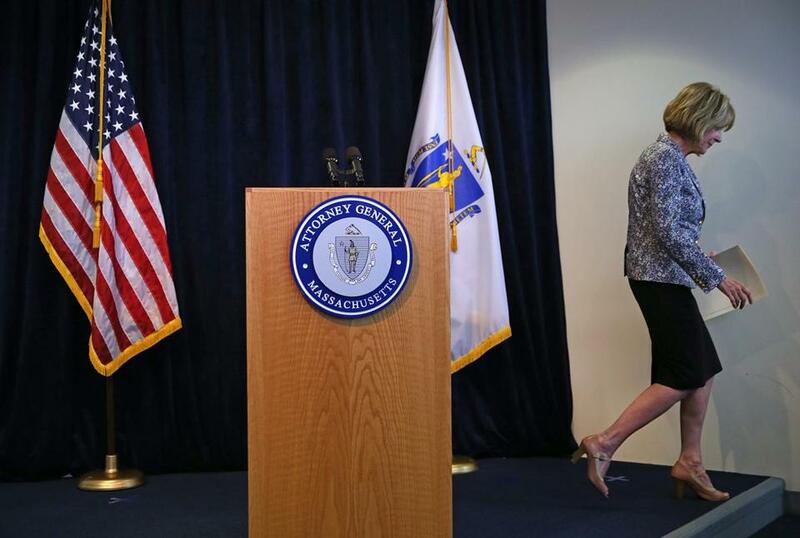 For Coakley, the day was a lesson in the perils of her office. Just as she has benefited from her battles against the federal gay marriage ban and predatory lenders, so, too, can she be hamstrung by her day job. Like Coakley, Reilly adopted in court a position whose legal standing ultimately proved as untenable as its political prudence. Reilly, at the height of the state’s gay marriage debate in 2005, defended a 1913 law that prevented out-of-state couples from marrying in Massachusetts if their marriages would not be lawful in their home states. That stance further soured already dubious liberals on him. And like Reilly, who suffered in the Democratic primary because his legal work put him to the right of the party’s electorate, Coakley risks political exposure because of her work as the state’s top attorney. On Tuesday, her rivals piled on. Republican Charlie Baker called the court decision a “rebuke” of a “poorly reasoned position,” while Democrat Don Berwick trumpeted his status as the only candidate in his party to oppose casinos outright. And Coakley has not heard the end of it. As voters tune into the race before the early Sept. 9 primary, Coakley will be derided as the candidate who sought to strip voters of the right to take an up-or-down vote on casinos. If she hangs onto her vast lead in the polls and emerges as the party’s nominee, she’ll hear it until November.